If you haven't any plans for New Year's Eve and fancy dressing up as a London Underground station, you should head over to The Chippenham pub at Maida Hill. The pub doesn't seem to have an active website, so if you fancy going, best contact them to find out what time it starts. Alternatively lurk around Maida Vale Tube station and follow all the knights, barons, bishops, angels, and people with beehives or dressed as cans of lager. 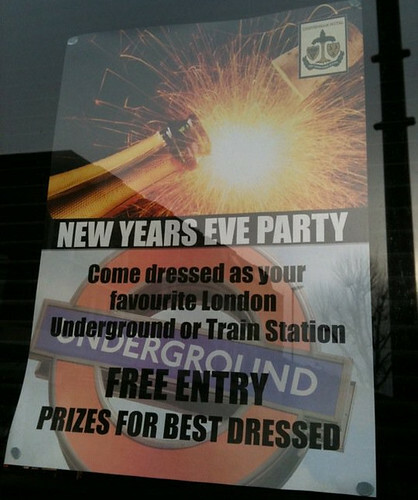 If you've already got plans for New Year's Eve, Bringstuff will be holding their second London Underground Fancy Dress party on 5th February 2011 - details here! 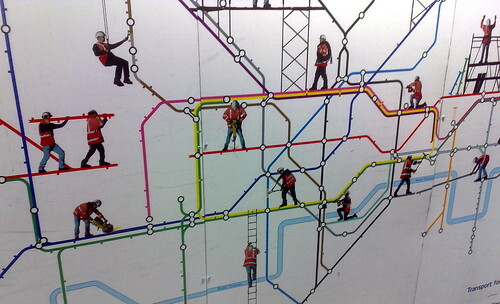 According to the guys at HeyUGuys, who found this, "there is somewhere called Liverpool Street inside The Grid!". 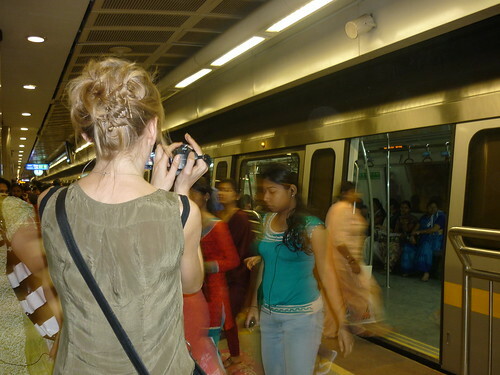 They also "plan to print off and use for my regular trips to London from this day forth! Who’s with me?!!" Iamclu has also Tronified the new London bus which looks pretty awesome too. Hat Tip to Jemimah Knight for spotting this! 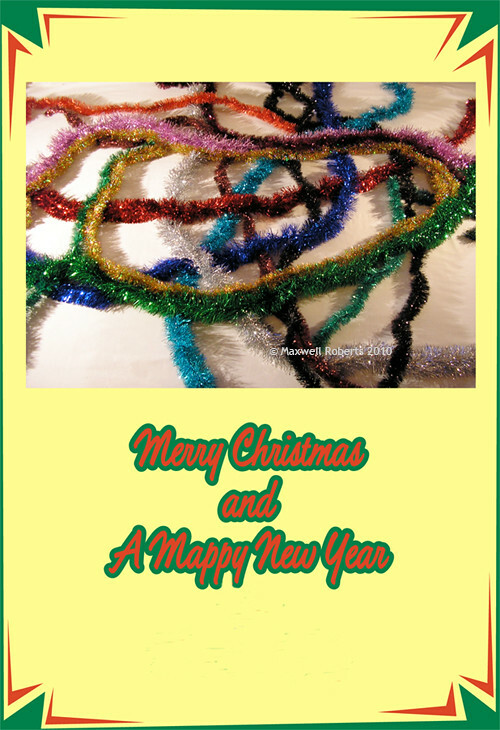 Linked to glowing Tube map and following on from yesterday's Tinsel Tube map, Chris Constantine remembered that he'd created a card a few years ago called Tube Fairies with fairy lights forming the Tube map. He said "I lived in North Woolwich at the time, thus the plug socket!". Update - 24th December 2010 - The Tube strike on Boxing Day will go ahead as the eleventh hour court action by London Underground - described below failed. As with other strikes this year, TfL have laid out on their site, services they expect to run (there's also a summary on their press release). However, as with previous strikes it's always best to check their website before you leave home for up to date information on the services on your line. London Underground are seeking an injunction against what they believe to be a "completely unnecessary" strike. 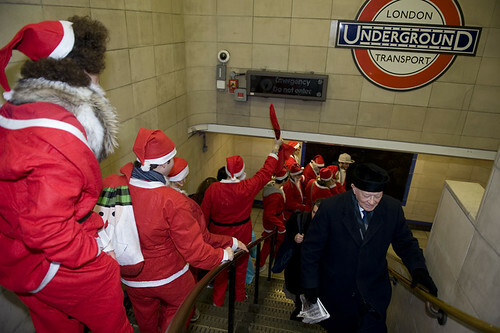 In 1996 drivers union ASLEF signed an agreement that it would consider Boxing Day a normal working day in return for longer holidays and higher pay. However, the union has said increased Tube services on bank holidays meant drivers now have to work more Bank holidays than when the agreement was originally signed. 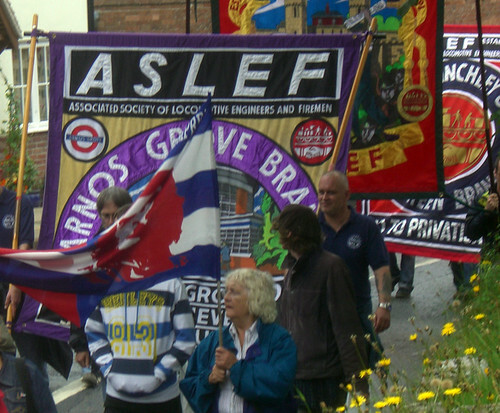 ASLEF are due to stage a 24-hour walkout on 26th December 2010 and are claiming triple pay and a day off in lieu for working on Boxing Day. A TfL spokesman said: "The union has ripped up a long-standing agreement on pay and working hours that gave LU employees increased pay and 6.8 weeks' holiday, in return for working some public holidays. We have tried to resolve this through negotiation, but our offer to reduce the number of drivers rostered to work on Boxing day was flatly rejected. "This left us no option but to seek a legal solution." An ASLEF spokesman said: "We are disappointed that, instead of trying to resolve the dispute, LU is taking the legal route. "But nowadays it seems par for the course to go to the courts rather than sit round the table." In the meantime Howard Collins Chief Operating Officer at London Underground has written to ASLEF members urging them not to strike. He said "ASLEF clearly did not want to make any concession on its triple pay claim and it did not seriously consider our proposal to amend our service plans. "The increase in service we plan for this year's Boxing Day is in direct response to the doubling of demand for service that we have seen in recent years. Furthermore, if we were still running the levels of train service we were running 15 years ago we would not have created additional jobs for train operators. The more service we run, and the more customers we serve, the better - not just for our customers but for our employees. In addition, rumours about Christmas Day working are simply wrong - there is no plan to do this, and if - in the future - any such long-term proposals did emerge, they would be a matter for discussion with trades unions representatives well ahead of any changes. Please consider whether going on strike will achieve anything, other than loss of pay and damage to our commitment to this city. The proper route to a resolution of this issue is through discussions within our established framework - not through the threat of strike action." Whether there's time for the last minute legal challenge to stop the strike obviously remains to be seen. London Underground last went to court in June to try to stop an RMT walkout. 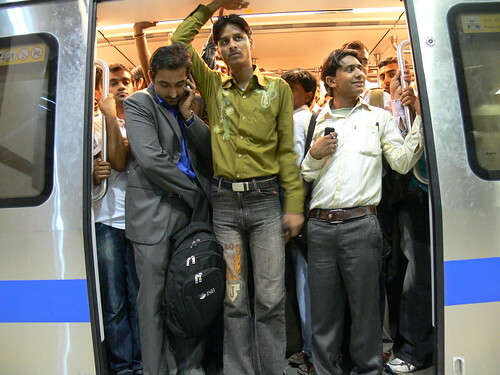 However the High Court ruled that the strike could take place. 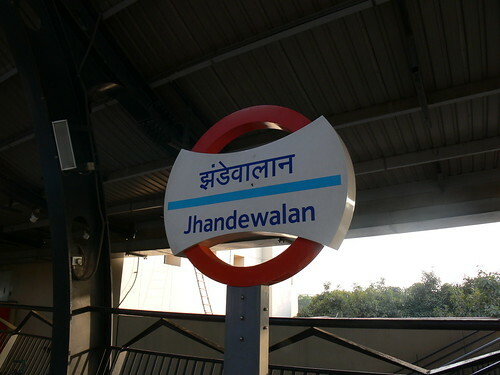 Bloggers were quick to note that TfL have been pretty quiet about the identity of this year's free New Year's Eve Tube, bus and DLR co-sponsor. Probably because it's Wonga - the online loan company whose interest rates range from 444% to nearly 3,000% in some cases. Adam Bienkov aka Torytroll said "Now I know sponsorship is hard to find, but should the Mayor really be encouraging London's most desperate and needy to get themselves into even more debt over the Christmas period?" Jeanette Arnold, Deputy Chair of the London Assembly said "People in desperate need subsidising free New Year's travel in London - not surprised Mayor's office is staying quiet. It's a total disgrace." Green Party Assembly Member Jenny Jones said "The Mayor of London must understand promoting 2689% borrowing is stupid and dangerous." Stella Creasy, Labour MP for Walthamstow has written an open letter to Boris Johnson asking him to change his mind over the deal. She said: "I've tabled legislation to try to deal with the worst excesses of these companies and protect the poorest consumers in the capital but Wonga have written to me opposing these proposals. ... MPs of all parties agree with me that something should be done to tackle these problems and are supporting these proposals." Mayorwatch asked the Mayor's Office to comment, his request was passed onto to TfL who made the following statement "Transport for London (TfL) each year seeks support for the provision of free travel on New Year’s Eve between 11.45pm and 4:30am. 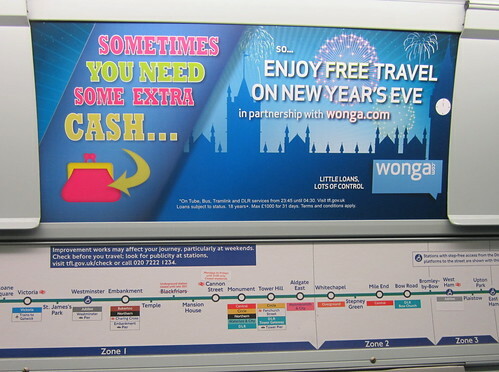 Wonga.com is making a contribution in support of free travel for this New Year’s Eve, and is licensed by the Office of Fair Trading and regulated by the Consumer Credit Act 1974." In the past Nat West, and ING Direct have sponsored the free travel. Before that drinks companies like Fosters and Smirnoff were the lead sponsors. 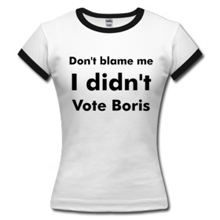 Boris's booze ban on public transport probably put a stop to that. I wonder how many New Year's revellers are going to care or even notice who's getting them home for free? Is it right for MPs to take the moral high ground on this? Or does it bother people that loan sharks (or their online equivalents) are potentially being seen as benevolent over the festive season? How many people would rather pay for travel that night than have it partially sponsored by Wonga? Perhaps this time next year, free New Year's Eve travel will be sponsored by one of the many "cash 4 gold" companies! Would that be worse? 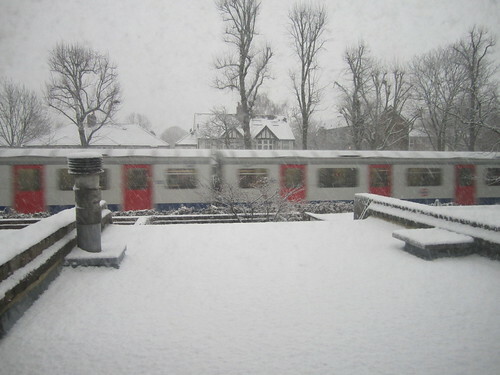 Expect delays on most London Underground Lines today due to the snow. At time of writing this on Monday morning, only Jubilee, Victoria, Northern and Waterloo & City Lines have a good service. 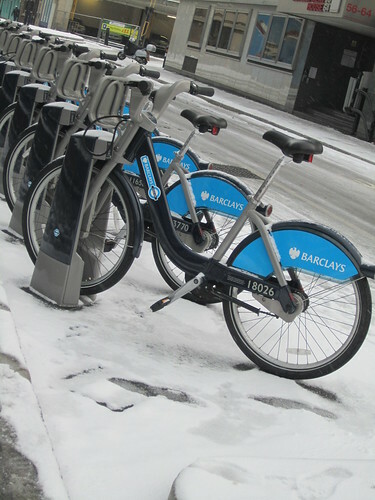 TfL's "cold weather plans" have been put in place to deal with the snow and ice. 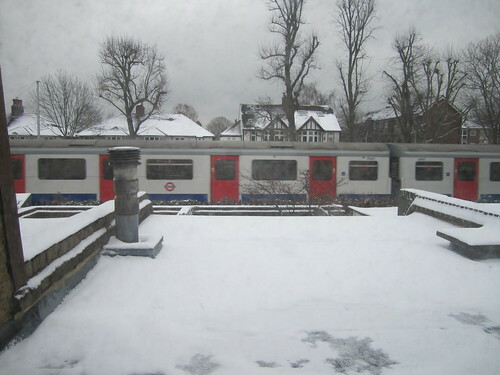 TfL say: "Stocks of specialist de-icing fluids have been topped up and, if required, arrangements are in place for trains to run overnight across the various networks. Additional engineering staff will also be on standby to respond swiftly to any incidents that occur during the cold weather." As usual, check their website to see what's happening on your lines. There's more snow forecast over the next couple of days, so keep safe on the pavements and roads - it's slippy out there! 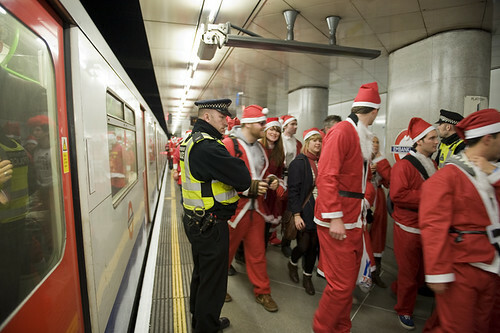 A group of disgruntled rail commuters gathered at Charing Cross station Wednesday to stage a festive protest about Southeastern trains. Adam Halall, from St Leonard's, East Sussex, regularly travels on the Hastings to Charing Cross line, and organised the sing-a-long to an inspired version of The 12 Days of Christmas. Here's the lyrics in case you couldn't make them out from the video above. And there's no trains the rest of the week. A Southeastern spokesman said: "We always welcome all feedback from passengers, in whatever format it may come in." Hat tip to @BCCletts for letting me know about this. Yesterday I was lucky enough to have a chat with TfL's Transport Commissioner Peter Hendy. Due to partial incompetence on my part & problems on the District Line, I was late. Fortunately London Reconnections and IanVisits were on time, so hopefully, they'll have more on Hendy's opinion on what the Comprehensive Spending Review will mean for London's Transport. When I arrived the discussion had moved on to Hendy's thoughts of how most of the world's transport systems were actually surprised London had a long term strategy for transport & that it was (finally) being carried out. Hendy struck me as a person who was extremely keen to get on with the upgrades needed & speed them up. He's well aware of the perception of bad communication of improvements and the seemingly endless engineering work. He's clearly not a fan of those posters which show cartoons of men carrying out work on the London Underground. In the future we'll see less of these and actual photos of broken rails, points, signalling and the like, in an attempt to show us what work is physically being done & how long it takes. We got the impression there will be fewer block closures on the Tube than TfL's new strategy just announced (first of which District & Circle Lines between High Street Ken & Edgware Road). Mainly because there's actually few parts of the Tube which you can close down for weeks at a time without causing complete chaos and offering reasonable travel alternatives. Hendy's obviously a mine of transport information having worked for London Transport since 1975. I must admit my brain partially switches off when people talk about buses, but Hendy's attention to the new buses went right down to making sure it was easy to clean sick (& other nasty stuff) off them! Probably something a lot of Transport commissioners wouldn't talk about. We also learnt that before stations on the former North London Link were closed overnight, a whole colony of down and outs lived at Kensal Rise station. 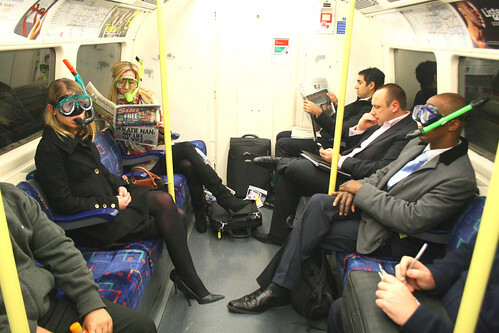 Even though it's December, inevitably you can't talk about the Tube without talking about air conditioning. Ian asked how much of the plans to cool the London Underground were at risk with the funding cuts. Hendy wasn't sure, but said the challenge was more about trying to create a system that generated less heat in the first place. That was easier than getting warm air out. So the plans are for lighter trains like the new ones on the Victoria Line. With Tube passengers numbers at a record high of four million journeys a day, I asked Hendy if he had a magic wand, what could he do about capacity and how he could make our Tube journeys more comfortable & pleasant. He said "Firstly I would wish that Trade Unions would recognise they shouldn't continually threaten to go on strike". Hendy said that union leaders seem to think that as the Tube is publicly owned, that money will come from somewhere and demands will be caved into. "Don't get me wrong, the vast majority of staff are fantastic," he added, but he obviously felt that the bargaining tactics used by unions were influenced by the thought of a bottomless public vat of money. 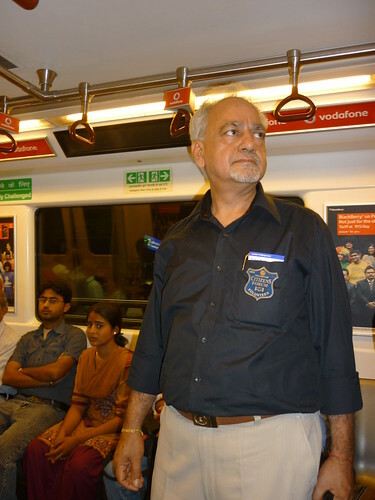 "Secondly, work on improving the system has to be done and it has to be done now. There's no easy solution to increasing capacity. Sadly there isn't a magic wand. But we need to explain properly what work needs to be done. "Finally I'd wish that no new governing methods like PPP were invented. Hire the right management teams and leave them alone to do the work. We don't need arbiters and regulators as this slows things down. We just need people who know what they're doing." I'd like to thank Peter Hendy for spending time with us and we hope to be able to chat to him again next year. Look out for IanVisits and LondonReconnections posts as they're sure to cover more of our conversation including Hendy's thoughts on mobile phone coverage on the Tube, how TfL works with National Rail in London and what he thinks about Boris Bikes. 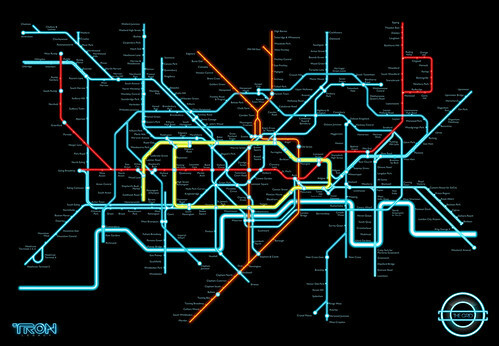 One alternative London Underground map I didn't want to see. Remember the kerfuffle when the Thames was taken off the Tube map last year. 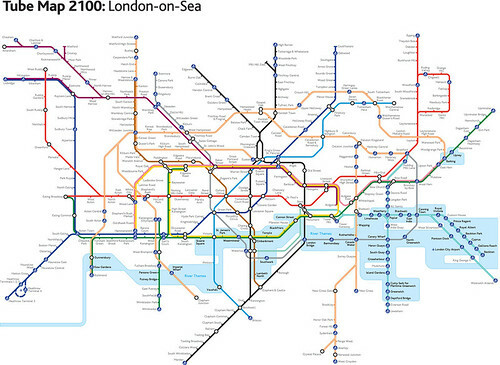 Well here's what the Thames could look like on the Tube map in 2100 if no action on climate change is taken. Just a four degree rise in temperature could raise sea levels dramatically. Margaret Gardner, Director of Practical Action, the organisation who put the map together, said: "If no action is taken against the temperature and sea levels rise as predicted, large areas of London could be underwater by the end of the century – a frightening thought. Not great news for our children or grandchildren. "In London we have an insurance industry and the necessary capital to do something about increased flooding risk. We can build barriers and do whatever is necessary. But in Dhaka and other cities in the developing world, there isn’t the spare cash to just invest in infrastructure to help people to adapt to climate change. So the answer has to be to avoid climate change in the first place." Certainly brings home the ominous lines from The Clash who sang: "Cause London is drowning and I live by the river". For more information and to sign up to Practical Action’s climate change campaign ‘Face Up to 4C’ please visit www.practicalaction.org/face-up. 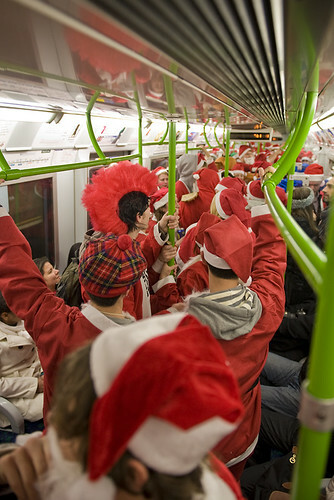 Once again there's many Santas (or should that be Santae) having fun on the Tube in the annual London Santacon on Saturday. Where hoards of Santae zoom around central London and give parents nightmares trying to explain how "there's really only one true Santa Claus and the people taking pictures of each other on escalators, getting stared at by policemen and cramming themselves into phone boxes, are only pretend Santas"
Thanks to by the light divided for letting me use his great pictures from his Santacon set! London Underground drivers have voted by 9-1 to go on strike on Boxing Day in a management disagreement over Boxing Day pay. London Underground claim 26th December is an normal working day and a longstanding agreement has been in place with trade unions over pay and drivers would get a day off in lieu or work reduced hours. Terry Wilkinson, the EC member for District 8 from the union said: "It used to be almost guaranteed that if you worked one bank holiday, you would not work the next. But the increase in service levels (and that Boxing Day is a Sunday this year) has meant this is now no longer possible." The union is claiming triple pay and a day off in lieu for its members for working on December 26, saying LU is refusing to offer any extra pay. 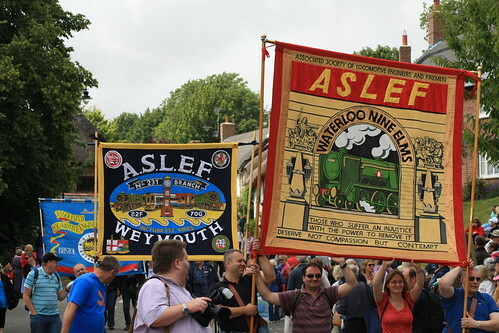 ASLEF general secretary Keith Norman said: "It is painfully obvious to any reasonable person that Boxing Day is not an ordinary working day and therefore it is no surprise that Aslef members have reacted in the way they have." The vote was 1,025 for strike action, with 127 against, a 9-1 majority in favour of taking action on Boxing Day. As yet there's nothing on ASLEF's site to confirm when the strike action will actually take place and no statement from London Underground on the impact this will have on the Tube service. Update from ASLEF's site: ASLEF members employed by London Underground Ltd will be withdrawing their labour for all turns commencing between 00:01 and 23:59 on Sunday 26 December 2010. ‘I am prepared to discuss this with the company but if they want a meeting they are going to have to have something to put on the table,’ says Keith Norman. Update from London - 16th December - a statement was issued on their site "We have a long-standing agreement which all of trade unions are signed up to and which we have published today, which covers staff working arrangements on bank holidays, and Boxing Day is included in that agreement. To tear that agreement up and seek to disrupt the festive period for Londoners in this way is just cynical. "We have made every effort to resolve this issue with the Aslef leadership, which has refused to attend talks at ACAS to discuss its claim for triple time and a day in lieu for its members." 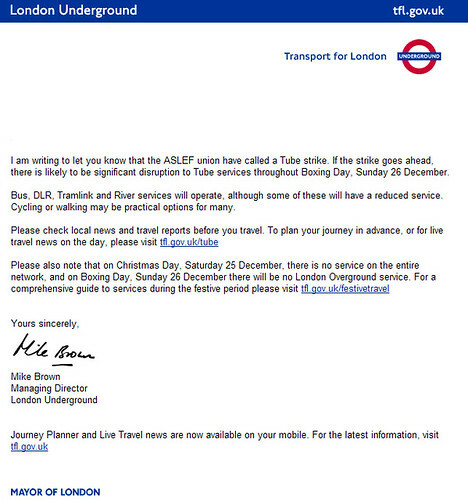 Note "there is likely to be significant disruption to Tube services throughout Boxing Day". 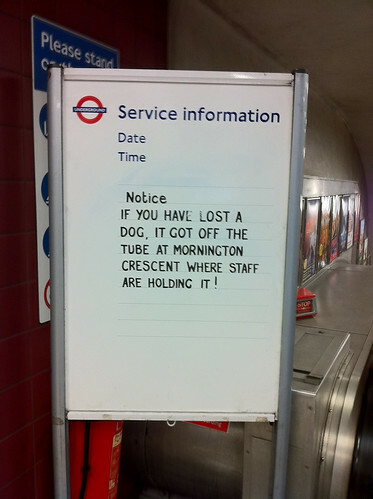 Where do dogs go when they get lost on the Tube? 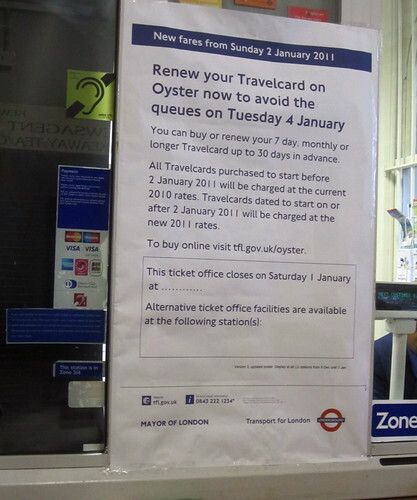 Samuel Powell spotted this neatly penned notice at Kentish Town London Underground station this morning. Wonder if it was using the Rexley-Ruff rules to get there? Update - Here's what happened to the dog. He was found by Rosy who said in the comments "My boyfriend and I were in fact holding the dog! We ended up taking him to work with us as Mornington Crescent station would have had to close its doors if it took on the responsibility of looking after a dog for a couple of hours due to staff shortages. We named the dog Frank, fed him sausages and gave him lots of attention! He was reunited with his rightful owner a few hours later. Frank had an eventful morning and everyone misses him at the office!" RMT union leaders have called for Northern line drivers at the Morden depot to strike for 24 hours from Friday 17 December until Saturday 18 December 2010, in a row over staff dismissals. However, the ballots which took place earlier this week showed Northern line staff rejected the strike call. Of the 192 staff balloted over the dispute, only 80 voted, with less than 20 per cent voting for strike action - 38 people. The driver in question has not even been dismissed. 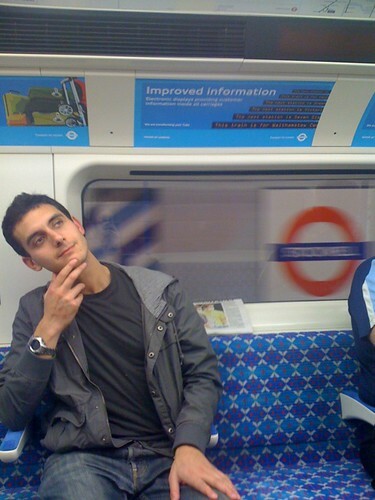 A similar low ballot turnout occurred over the dismissal of a Bakerloo Line driver. Just 42 people voted for strike action out of a total of 119 balloted - that's a third of the total members. Howard Collins, LU's chief operating officer, said: 'The RMT leadership has utterly failed in its attempt to gain support from staff on the Northern line for a driver being dealt with over allegations of totally unacceptable and abusive behaviour towards colleagues. "It is also utterly outrageous for the RMT to threaten strike action in support of someone dismissed for a serious breach of safety rules on the Bakerloo line. 'The facts speak for themselves. Yet again, the RMT leadership shows utter contempt for Londoners and the integrity of their own strike ballot process. Bakerloo Line London Underground tube drivers based at Elephant & Castle and Queens Park, have also been asked by the union to stop working at the same time. Bob Crow makes no mention of the low turnout and the low numbers of people voting for strike action and says "Instead of harassing our members and activists on trumped up charges the London Underground management should be directing their energies into reaching a settlement to the on-going disputes over tube safety and safe staffing levels." Instead of striking when the majority of people who voted clearly didn't want to strike, I'd suggest the RMT leaders should be directing their energies into proving exactly what safety issues are at stake in the wider Tube strikes. 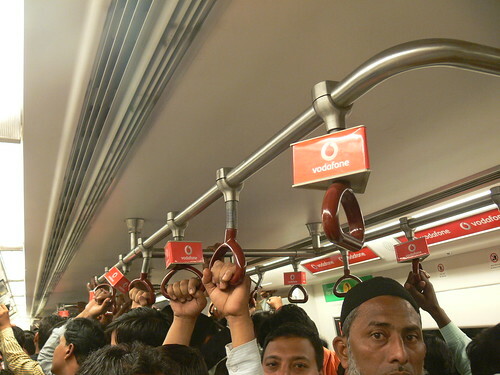 On a practical level, I'd imagine these calls to "down tools" will have little impact on the Northern & Bakerloo Lines. London Underground (& I'm guessing all the people who didn't vote to strike) fully intends to run services on these and all other lines. 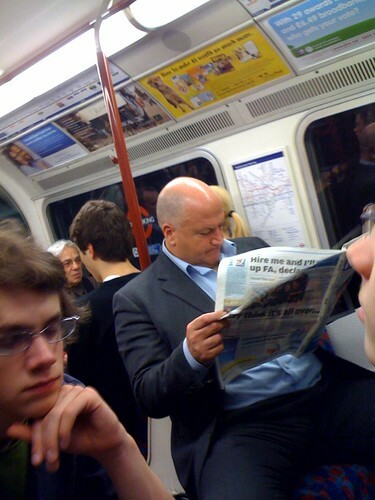 But check the Tube's website before you leave for the latest information. 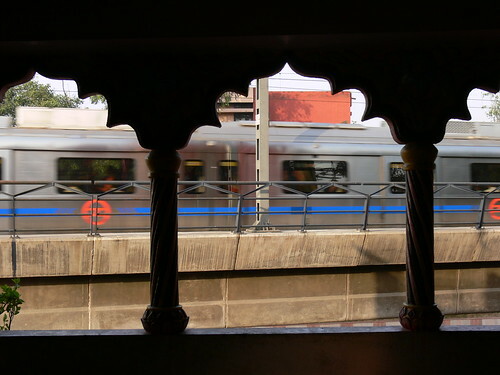 Update 17th December 2010 - According to Harrow Observer Bakerloo line services will be suspended between Harrow and Wealdstone and Queens Park stations on 18th December due to the above action. Members of the RMT union will walk out at 9pm 17th December for 24 hours and while tonight London Underground (LU) said the service will be 'largely unaffected', tomorrow only a partial service will be in operation south from Queens Park south to Elephant and Castle. 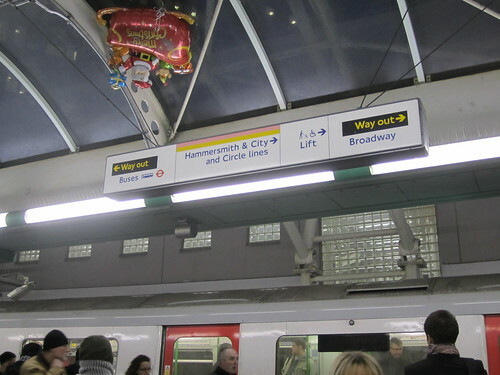 A giant Santa balloon floating above heads at Hammersmith London Underground. It's been there for a few days now - wonder how long it will take to come down? If you spot any other Xmassy Tube sights (it's just coming up to office party season) send them my way and I'll feature the best here. If you're looking for TfL's plans for Christmas & New Year opening hours on the Tube - visit their site. Someone needs to build one of these for the London Underground & call it Tubingo. 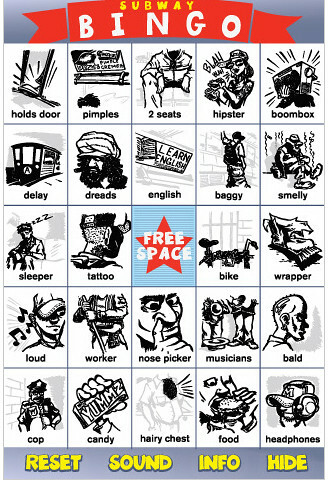 You've probably played "Lingo Bingo" in meetings at work, marking off buzzwords each time they're mentioned. Now there's a free subway app based on ticking off the people you see on a Metro commute in New York. The designers describe the app: "Have fun riding the subway while finding and checking off all of the characters that subway commuters know and love. When you get five in a row, BINGO! Created by New Yorkers, this game features beautiful artwork and an insider's attention to detail. Subway BINGO is a totally fun way to pass the time on the train or subway platform....Dozens and dozens of real-life characters, moving subway doors, and more! 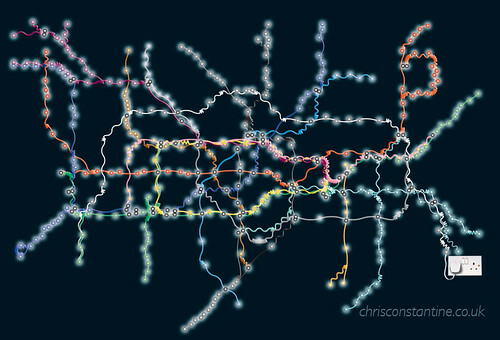 It would need to be Tubecized / anglicized to cover London but I reckon it would be popular. In fact it reminded me of the spoof video of teenagers playing "Tube Poker" - supposedly "an illegal gambling craze played on the London Underground". Hat tip to S N Barnes for the link! 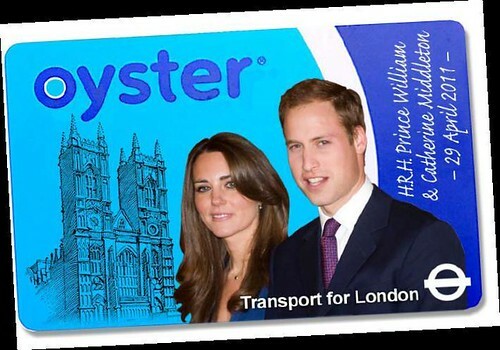 TfL look set to cash in on the Royal Wedding by producing a special edition Oyster card. In what I hope is just a mock up (because it looks awful), the Evening Standard have a design on their website. 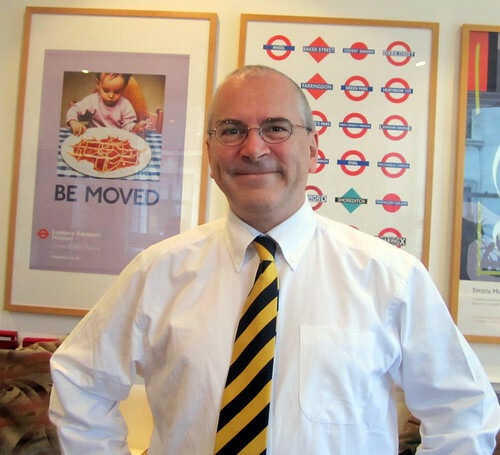 TfL commissioner Peter Hendy wanted to follow the Hong Kong example of selling limited edition cards, some of which are apparently worth a fortune. He said "We will do one for the royal wedding and it will be extremely tasteful. It will be the first-ever one we have put on general release." Kulveer Ranger, the Mayor’s transport adviser, added "It’s early days but it's an exciting opportunity. We want to help celebrate the fantastic occasion that will be the royal wedding. It's a good way to bring a level of excitement and ingenuity to something we rely on every day." 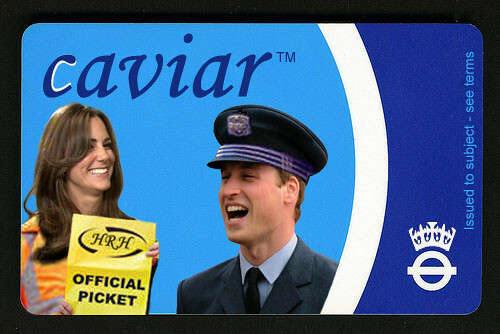 Can't you feel the excitement of swiping Kate and Prince William on your daily commute? I can hardly wait! Update - Jon Justice has sent in a mock up for the card that could be more interesting! Perhaps TfL can get some ideas from it!